Map dowsing is a very useful skill to have to enable you to work from home, on a site anywhere in the world. It helps you to narrow down the target area for what you are looking for. This saves you time and your clients money. 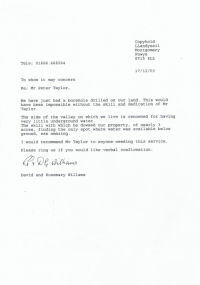 For example, If you look at the oil and gas section of this website, you will see a letter written from the late Michael Poynder PhD, when he was in Australia. 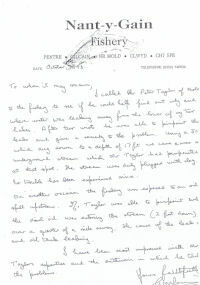 He confirms, in this letter, that his geologist had come up with the same results, that I had. The difference being, his geologist was on site in Australia, and I had map dowsed here in the United Kingdom. Another example is that I was requested to map dowse for gold for Clogau Gold in Wales. From home, I successfully map dowsed three separate areas in the mine which proved to be successful. 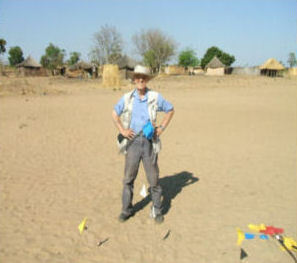 As a professional dowser for the last 29 years I have used map dowsing for more than fifty percent of my work. Some of the countries that I have been asked to map dowse have been Australia, America, Africa, France, Italy, North Sea, Shetlands etc. 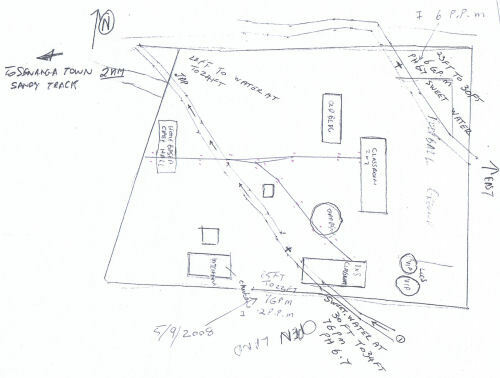 This is the plan of the Orphanage School that I map dowsed before site dowsing in Senanga, Zambia. You can see the flow aquifers marked with lines along a series of small crosses. The flow aquifer marked in the top right hand corner was the one eventually chosen to supply the well, as this carried the cleanest water. I have many references resulting from this work, see the section on Abenbury Spring Water and others at the bottom of the home page. I use map dowsing for locating oil, gas, gold, water and geopathic stress. I sometimes get asked, how can this work? No one really knows the answer. My own theory is that as a professional dowser when I am approached to carry out a map search I ask the client for a map of the area that they are interested in. They inform me what they are wanting to find. The map itself is a connection of a place on our earth, which then you visualise the location on the map. Using the pendulum and a marker you slowly move across the map/plan and suddenly you may get a reaction from the pendulum, if what you are looking for is there. You then approach it from a different angle until you get another reaction. This you continue to do across the plan. This will narrow it down and depending on the size of the plan, if I have got a reaction I will generally enlarge it several times to improve the accuracy. Be aware when checking for underground sources of water by map dowsing it is important to ensure that it is not a seasonal flow, or what is sometimes known as a ghost flow, flow aquifer. This is because they are not continuous flows, but they leave a reaction of water even when the water is no longer there. For instance, in the Summer the flow may no longer be there, but in the Winter the flow will be there. When map dowsing please make sure that there are no other maps beneath the map you are working from as it can conflict with the map you are working with and give you false readings. Please ensure that you check to make sure that you are ‘positive’ and not ‘negative’ before you start. When map dowsing you will need a water sample in a bottle as a pendulum and you will need a marker. A marker is the connection to the site. You put the marker on the plan/map which then gives you the connection to dowse. A marker can be a pencil, or a pen cap, or a pointed object made out of plastic or wood ( It is advisable to not use anything metal when dowsing for water as this will cause interference with your dowsing). Please remember to work as if you were on site. For example, when you have a map or plan in front of you, you concentrate on looking for the amount of water beneath the ground that your client needs. You need to visualise that quantity of water and ask is that amount of water in that area. If you get the answer ‘YES’ then you ask for the location. The pendulum will then swing towards the location. You then move your marker slowly, in the same direction, and at the same time, that the pendulum is swinging. Eventually the pendulum will change its course. That is the indication that this is approximately where the underground source should be. You then mark that point and then go from the opposite side, as you would do as if you were out on site. You will then get a reaction again, at some point, near the previous mark that you have put on. You continue this process on the map until you have completed both sides of the source of water. You then should have two lines creating a channel across the plan or map. You can then go to the centre of the channel and ask for the flow direction. You can roughly work out the quantity of water and estimate the depth of the water from the centre of the source. If you want to learn more about map dowsing please look at my courses on this website. Map dowsing is only ever a guide, and a site visit is always recommended. I also teach map dowsing courses. Please see teaching section on this website. Both of the testimonials on this page relate to jobs where map dowsing played an important part. Please include your telephone number for a quick reply.